Fiji FA president Rajesh Patel revealed this during the Pool draws at Courts Store in Ba on Thursday. Patel said the premier division winner will receive $20,000, an increase of $2000 from last year and the runner-up will get $5500 while the losing semi-finalists will receive $1000 each. “For the senior division the winner gets $7000, the runner-up $2000 and the losing semi-finalists $250 each. Patel also announced an increase in the Primary and Secondary School’s competition. “The secondary school’s winner will receive $1,500 and the runner-up $500 and the primary school’s winner will get $1000 and the runner-up $250,”said Patel. 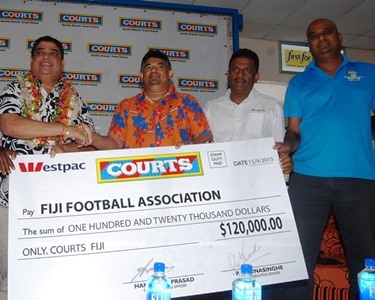 Patel said Courts Fiji Limited has increased the sponsorship from $115,000 to $120,000 which is an increase of $5000 for the 77th Inter District Championship in Ba this year. “We are grateful to Courts for their support, “said Patel. “This is a very exciting year for Fiji FA and as we all know this 16th consecutive year for Courts sponsorship for IDC which is one of the largest sponsorship for Fiji FA events. “Fiji Football Association is proud to be associated with Courts as a major and the oldest and most prestigious football event. Patel said the IDC is recognised as one of the oldest tournament anywhere in the world which started in 1938. “Under Courts Fiji Limited’s sponsorship and guidance,football has been one of the beneficiaries of the commitment of the company to sports sponsorship and community involvement, “said Patel. “The IDC title now carries the prizemoney making it amongst the biggest tournament in Fiji and the generous continual sponsorship by Courts. “The IDC means so much to the people of Fiji and over the years the memories came up with football fans, the matches and the match winners and those who are alive and not alive but still the memories linger with us. “There are many fond memories of the players like Augustine Thoman, Josateki Kurivitu, Zikar Ali, Esala Masi, Mira Sami, Farouk Janeman, Ernest Doughty, Sam Work, Jone Nakosia and Jo Tubuna,”he said. “Their exploits over the years and their stories about IDC still live in lot of people’s minds. “Today’s stars will take centre stage during the tournament. District pride, passion and the cup brings in players and fans from all over the world, Many Fiji residents overseas plan their holiday to coincide with the IDC. Patel concluded that this year’s Courts IDC promises to be an annual carnival of sports and social interactions. Meanwhile newcomers Dreketi has been drawn in a tough pool with reigning champions, last season’s runners up Nadi and Lautoka in Group A while tournament host Ba is in Group B with Battle of Giants champs Rewa, Fiji FACT champs Labasa and Nadroga. In the Senior Division, defending champion Rakiraki has been drawn in a very tough pool. The North-Westerners are in Group B with newly demoted Tailevu Naitasiri, Seaqaqa and Nadogo. Tavua, Savusavu, Vatukoula and Navua make up Group A while Group C has Northland Tailevu, Nasinu, Lami, Bua and Taveuni. The Courts IDC will kick off with the first round of matches across different venues on October 03 and 04 and the tournament proper begins at Ba’s Govind Park from October 07.